Here’s what we do to try and save our engine from immediate disaster. Thanks Mercedes for trying to confuse us about what type of fuel to use. The smell of diesel fuel stays on your hands for ever. The greasy fuel seems to hang out on the pump handles a lot more than gas does. We threw a handful of nitrile examination gloves in the driver’s door cubby. We’ve got used to wearing one on our dominant hand when we’re fueling up. Reaching for one reminds us that we’re doing it because we are working with diesel. That in turn reminds us that we’re filling up with diesel, not petrol. The warnings on the fuel cap weren’t big enough for us, so we also bought some “Diesel fuel only” stickers. They aren’t as high quality as we’d hoped (they aren’t particularly solvent-proof) but they do the job. Stuck on the inside of the fuel flap, it’s pretty darn obvious to us and to anyone else what type of fuel the van runs on. What if I do fill up with gasoline? If the almost-worst happens and you do end up with a tank of gasoline, don’t panic. Do NOT move the vehicle away from the pump. Do not even put the key in the ignition, because you don’t want the fuel pump to turn on and start circulating the contaminated fuel into the engine. Even if it was entirely your fault and the gas station is getting angry with you for blocking one of their pumps, do not move the vehicle. Get the tank pumped completely dry, then refill with diesel and potentially also with a cetane booster. This type of additive typically has additional lubrication properties and might help prevent pre-detonation caused by any remaining gasoline in the tank. Disposing of the diesel-gasoline mix is going to cost you quite a lot of money, too. It’s counted as a hazardous substance, so unless you have another older vehicle with a carbureted gasoline engine that will take small quantities of highly diluted diesel fuel, prepare for an extra bill. If the absolute-worst happens, you may be able to drive away from the pump without realizing the issue, because there’s still diesel in the fuel lines from the tank to the engine. You’ll soon notice though. As soon as the proportion of gasoline in the fuel mix to the engine rises, the engine will start to run very rough. That’s because if you’ve driven with gasoline mixed in with the diesel, the fuel pump, filter, injectors and engine will be getting more wear. Diesel fuel is a lubricant, gasoline acts as a solvent. Gasoline may also pre-detonate in the cylinders, which leads to a knocking noise and can damage the cylinders and pistons. If this happens, the fuel supply system and engine are probably going to need some pretty major inspection and re-build work. Switch the engine off and do not drive it again until it’s been repaired. Here’s a video explaining the parts that’ll need replacing in a lower pressure VW engine. Just visualize more parts and more money for a Mercedes Sprinter engine. For us, this is one of several downsides to diesel. When gassing up in Oregon, we have the opposite problem. The attendants usually mistake our Promaster chassis for a Sprinter. That would be funny if it didn’t have such bad possible repercussions. The same vendor on Amazon sells “Gasoline” stickers too! 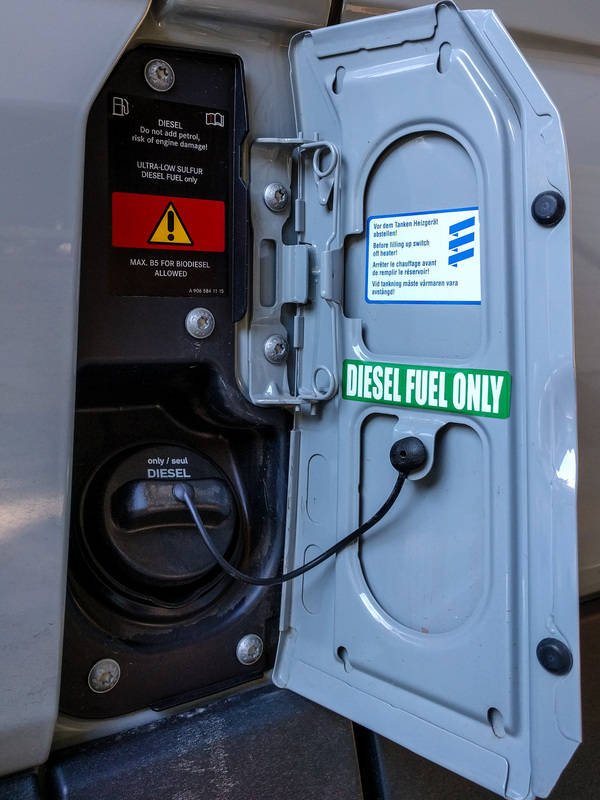 Interestingly, you can pump your own diesel in Oregon (https://www.oregonlaws.org/ors/480.315). It is gasoline (Class 1 flammable) that has the restriction. We live in Oregon and pump our own diesel every time we fill up. I still like the extra stickers, though! Yeah – I found that out on a recent trip (after years of driving in/through Oregon). And apparently now you can even pump your own gas in some rural areas, even though I hear some of the locals are worried about the prospect.